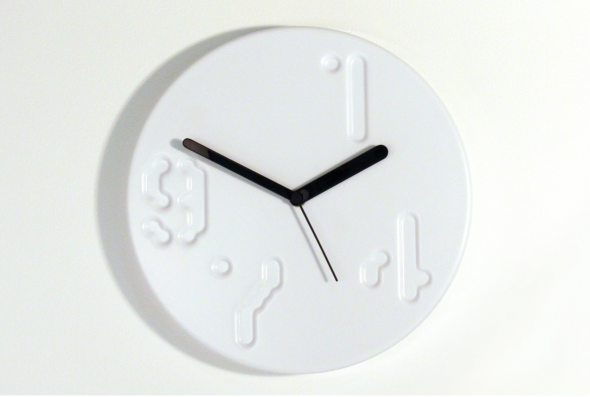 The clock combines digital fabrication with traditional, low-tech manufacturing. Laser cutting was used as a medium to experiment with vacuum forming moulds. Through the prototyping process the idea evolved of producing a clock face that acts as a canvas for beautiful numerals formed during the production process. The typeface “Three Six“, by MuirMcNeil, was chosen for its geometric clarity and its visual similarity to the CNC cutting paths that informed design development. The numerals; 1, 9, 7, 4 were used purely for their visual interest and the custom 3D printed hands have been designed to work with the proportions of Three Six. Currently in a Limited edition of 10 in white.